“The past can define our future. The opening scene of this sci-fi horror was promising. Even better, it was a snapshot that instantly caught my attention. A sublime and fascinating scene after which I snuggled in my cozy chair in anticipation for something magnificent. I was immediately convinced that this was going to be a hell of a movie. What did you expect? With a score like that on IMDb, this couldn’t go wrong. 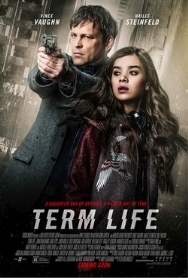 The frozen image of a puzzled looking girl smeared with blood, seamlessly merged with a tv-show where we get the melancholic picture of a generation with no future. The education system needs to be changed so a new generation of intelligent young kids is being produced instead of a generation of obese and hopeless youngsters . The images looked futuristic with a suitable graphic design. And then the flashy google glass lookalike is introduced. A gadget we’ll be watching through the rest of the film. Just recently I’ve seen “Jeruzalem” where they used the same kind of glasses. A disappointing film though. The only feat I was excited about was that high-tech device. Unfortunately this facet of “Let’s be evil” became a rather annoying element to me. Even worse. I got so sick of it that I wanted to give up already halfway the movie. The rickety soundtrack was perhaps an omen. Admit it. If you want to create a futuristic movie, you shouldn’t be using those stale Jean Michelle-Jarre polyphonic sounds. It felt as if I was watching a third-rate SF from the 80s. Unfortunately these weren’t the only disturbing elements. When the end credits rolled over the screen I made my final conclusion. This was probably the worst thing I’ve seen this year. First, the overall picture you get to see almost the whole movie. The fact that it all happens in a virtual environment (the three selected candidates can only see by making use of the spectacles) was at first an exciting and interesting display. It all looked great and wellknown (especially for those who sometimes sit behind a screen to have fun with some PC games), but it has one major drawback. After half an hour of hazy and swirling images, you gradually start to hate it. Biggest advantage is that a not so talented cameraman with virtually no experience gets away with it when some blurry and out of focus fragments appear in between. Combine this with a dark underground bunker where the lighting consists of pulsating lights in all sorts of colors and your irritation level is reached very quickly. It looked as if the whole story was set in a concrete submarine. And then you have the actors who were recruited based on some unknown requirements and who are participating in the Posterity Project. Judging from the conversations they have, the requirements concerning the level of intelligence needed for this job wasn’t very high. Their ultimate function is to observe the group of teenagers that are also present in this underground facility (spending their days waving their hands in the air). And when necessary they accompany a lost teenager back to the group. Not exactly intriguing and exciting. The fact that the group of children organize a sort of artificial uprising afterwards in which they manipulate the electronic system in an incomprehensible way, was the start of a confusing outcome and a ridiculous denouement. Finally, the part that frustrated me the most. I had no idea what the theme of this movie was about. And in the end, I still didn’t know it. Perhaps it’s me getting older and a mild version of dementia sneaked in my system, but I couldn’t make head nor tail of it. What was the opening sequence about and how did this correlate with the rest of the movie? And the end didn’t clarify anything either. In a subtle way they tried to demonstrate the dangers of technologies and the way it’s intertwined in our everyday lives. Kind of obvious. But eventually I still had a few questions about the film. Occasionally I like to watch a sophisticated film with a not so simple storyline. But this was a level too high for me apparently. 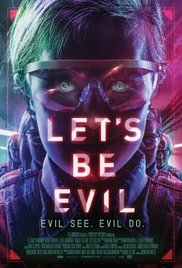 I suggest however that the creators of the IMDb website check their algorithms, because the score given to “Let’s be Evil” is totally irrational. Or was there an artificial intervention by the makers of this movie? Well, that’s a spooky thought! I guess it's a low budget movie. There are scenes in the movie that had to be supported with better CGI, obviously cracked otherwise. Plot has some similarities with the movie "The Signal(2014)" which is obviously a better choice for a sunday night.